StoryBook Theatre Presents, What if Romeo and Juliet. The Show takes place February 5 to 9. Check website for show times. StoryBook Theatre Presents, What if Romeo and Juliet… Presented in Partnership with Dynamo Theatre. This is a play that delves into the Shakespearean world and revisits the strikingly magnificent story of a great pain brought on by the hate between two families. The poetry of the bodies, the beauty of the bard’s words, the magic of the soundscape and appealing lighting all contribute as love, hate, revenge, tragedy, and romance come to blend. Could there be another ending to this famed story? What if someone decided to lay down one’s weapons? This show is recommended for ages 6 and up. For show times and to purchase tickets, visit the website. Takes place February 1 to 10. Canmore winters are fun and full of magic. Every February, the Canmore community comes together during the Canmore Winter Carnival to celebrate the best parts of their unique winter lifestyle. With the BMW IBU Biathlon World Cup in town this year, Winter Carnival will be rad! Join Canmore for two weeks of indoor and outdoor events and experiences: ice carving competitions, kids’ ice carving, the always entertaining pooch parade, World Cup biathlon races, and the amazing Snowy Owl Kid N' Mutt races! For the full festival schedule, visit the website. * Some events are weather dependent. Schedule subject to change. Joso's Open House Open House - Both Locations . Joso's Preschool, Kindergarten, Child Care, and Summer Camp Open House. Come to meet the highly-qualified teachers, see the amazing facilities, and learn more about these award-winning programs! Come and see why Joso's have been voted one of the Best Preschools and Child Care Centres in Calgary by parents like you for the last nine consecutive years! Creekside location: Unit 100, 12018 Symons Valley Road NW. 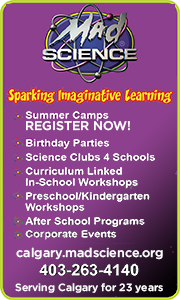 West Springs location: Unit 505, 722 - 85 Street SW.
Mad Science Planets & Moons Workshop. Mad Science Planets & Moons Workshop. Brought to you by The Calgary Public Library, presented by Mad Science. Join Mad Science and explore the solar system by impersonating the planets to compare their sizes and distances from the sun. Learn the difference between a solar and lunar eclipse and how space probes harness the gravity of distant planets to use less fuel. Build and keep a Mad Science® Gravity Assisted Launcher! Suitable for ages 6 to 12. Spaces are limited. To register, visit the Calgary Public Library website. Dive-In Movie at Southland Leisure Centre. Experience the movies like never before! Come settle in for a night at the movies in the water park. Lounge poolside or watch from the water. You’ll enjoy a great film and an even better time with friends, family, and neighbors. Concession and popcorn will be available. There will also be nightly door prizes. All ages welcome. For movie titles, visit the Facebook page.